Earbuds combine surprisingly strong bass with a fashionable style to deliver high-quality audio. Ultra-lightweight design is comfortable to wear during any activity. L-shaped stereo mini plug fits into standard auxiliary ports. Pump up the volume and enjoy crystal-clear sound from this mobile speaker. 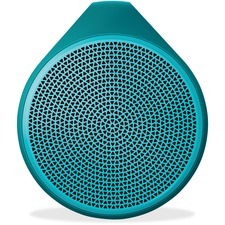 This portable speaker is perfect for life on-the-go. Take it on the road or relax and listen at home because this mobile speaker goes everywhere. Simple, intuitive design lets you wirelessly connect and stream music from your Bluetooth-enabled device from up to 30' away. Easily manage phone calls and volume control from your mobile phone. Enjoy five hours of continuous play before you need to recharge. Recharge the built-in, lithium-ion battery with the convenience of the included micro-USB cable. 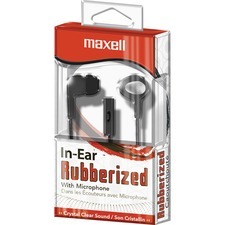 Experience complete listening comfort with soft, snug earbuds that conform instantly to your ears. Three pairs of included, ultra-soft earpads (small, medium, large) ensure a perfect fit. Large 9mm neodymium drivers produce a wider frequency response (10Hz-24Hz) than most earbuds in its class, providing a fuller sound listening experience from bass to treble. A 3.6' long, color-matched cord provides the flexibility and comfort needed for an active day and can be comfortably threaded through your jacket, bag or backpack. Plus, add a stylish touch to your music enjoyment with color-matched earbuds and audio cord. 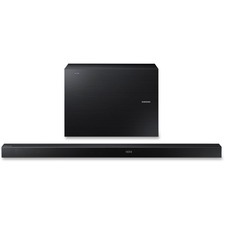 Expand your surround system by adding this 3.1 Wireless Soundbar. 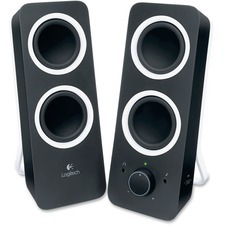 It delivers clear, balanced sound so you can experience crystal-clear dialogue with a dedicated center channel speaker. Each of the six built-in speakers is designed with a dedicated amplifier to provide clear, accurate sound. With state-of-the-art sound technology, the 3.1 Wireless Soundbar features Crystal Sound Pro and unparalleled Dolby Digital sound. A powerful wireless active subwoofer is included to deliver an incredible low end sound experience. Enjoy the immersive, clutter-free audio experience by easily connecting the additional speakers wirelessly via Wi-Fi. Customize the 3.1 Wireless Soundbar's incredible sound on your own terms with five intuitive DSP settings. 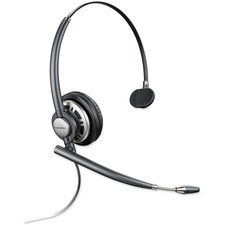 Corded headset provides premium audio, all-day comfort and intuitive call management in a user-friendly design. Smart Sensor technology lets you intuitively manage calls and audio by simply placing the headset on your head. Ultra-soft, leatherette ear cushions and a lightweight headband allow comfortable, all-day use. Two user wearing options accommodate those who want a richer, more immersive audio experience as well as those who prefer to leave one ear open to the environment. Simple controls let you answer/end, mute and control the volume of your calls with ease. Inline indicator lights and audio tones alert you of the connection, mute and volume status. A dynamic EQ feature optimizes your voice quality when on calls and automatically adjusts the audio settings when you're listening to multimedia playback. 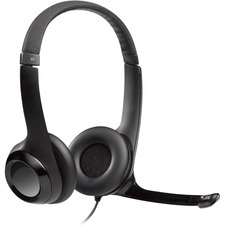 Premium PC wideband audio with a noise-canceling microphone delivers a more natural voice sound. EncorePro Headset offers an ultra-lightweight design with plush ear cushion and featherweight materials. Ideal for call centers. Noise-canceling technology delivers crisp and clear communications with no distracting background noises. High-frequency wideband response improves overall audio clarity and ensures clear conversation. Quick Disconnect cord offers the freedom to easily walk throughout the office without removing the headset. Adjustable clothing clip and 10' coil cord provide plenty of room to move. 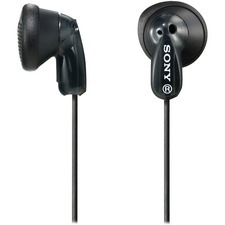 Single-ear design for either ear lets you hear what's going on around you without removing the headset. Extendable-boom microphone can be moved to optimize its position for calls and conveniently swings out of the way when not in use. 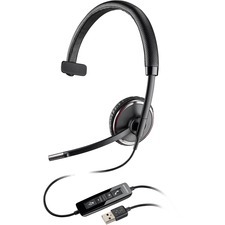 Headset requires a Plantronics audio processor, USB audio processor, or direct connect cable to connect to a phone. High-quality earbuds feature a microphone and remote control for hands-free operation without having to remove your device from your pocket or purse. The remote is located in an optimal location to easily accept and end calls no matter what you're doing. Three sizes of soft, silicone ear tips are included to provide the perfect fit for all ear sizes. 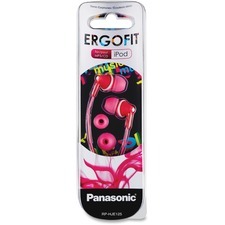 Lightweight earbuds stay comfortable during extended listening periods to ensure an enjoyable fit during any task.